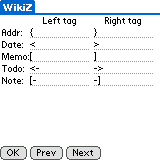 WikiZ is a Wiki utility for Palm OS 5. 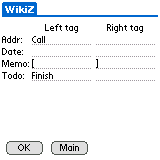 WikiZ is a simple Wiki software for Palm OS 5. Why do I have to write yet another Palm Wiki? The main reason is that Hangul, the Korean character system, is not recognized by most of Wiki programs currently available including PsLink and PalmWiki. What's wrong with Hangul? Well, PsLink and PalmWiki were developed by Japanese developers, so there is explicit support for a Japanese character encoding (SJIS). However, this prevents Korean users from reliably using Hangul, which uses another multi-byte encoding (mainly EUC-KR or CP949), so I decided to write my own Wiki. WikiZ does not assume any encoding, so it should be multi-byte safe as far as I can tell. 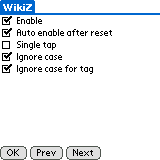 Enable: you can disable individual applications with these check boxes, but these options won't do anything if "Enable WikiZ" is turned off. DB: database names of old or new version of PIM. It depends on your device. 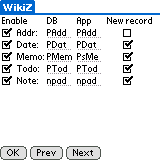 App: If you like replacement PIM software compatible with built-in databases, you can set these values to their CreatorIDs. New Record: It's sometimes very annoying to create new records every time you tap on a date or something. You can uncheck this option right here and links work only if you have pre-existing records. 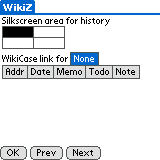 WikiZ supports history by dragging across the silkscreen area. The following description is based on Z22. and finish writing the last report! The default date tags are intentionally left empty for the automatic detection of system's date format (e.g., MM/DD/YY, YY-MM-DD). You don't need any tag for Calendar linking, but, still, you can assign its own tags. Automatic date format detection does not work if you have Date tags. (MM/DD/YY desc): find a "desc" event on MM/DD/YY or create a new record on MM/DD/YY. A seperator between MM/DD/YY and desc does not need to be a space and you can use any character you want: (MM/DD/YY:desc), (MM/DD/YY@desc). You can create nested links within a link. This is really useful for more flexible record creation. In the following examples, "<" and ">" are Date tags, and "<-" and "->" are Todo tags. WikiZ is freeware. USE IT AT YOUR OWN RISK! Simple pop-up memo just for WikiZ link: It will remove the need to create a temporary memo only for jumping to somewhere. Search forward/backward for duplicated records: For example, after tapping on <Daily Journal>, you can easily find all Daily Journal entries. Fuzzy searching: <* Journal> searches for "Daily Journal", "Weekly Journal", "Monthly Journal", and etc. Read-only jumping to arbitrary applications: how to reduce the inaccuracy of finding records? Pen stroke jump: Double taps are originally used to select a word. history feature clean up. Now it's more like that of PsLink. New versioning scheme: MAJOR.MINOR.FIXES_OR_EXPERIMENTAL_FEATURES. Since this version looks very stable, I've changed the version number to 0.1. Thu Apr 4 00:34:02 2019 . XHTML . CSS (lightbox.css is not part of Uniqki. ;-) . Powered by Uniqki!